Many thanks for your thoughts Chaps. All very much appreciated. 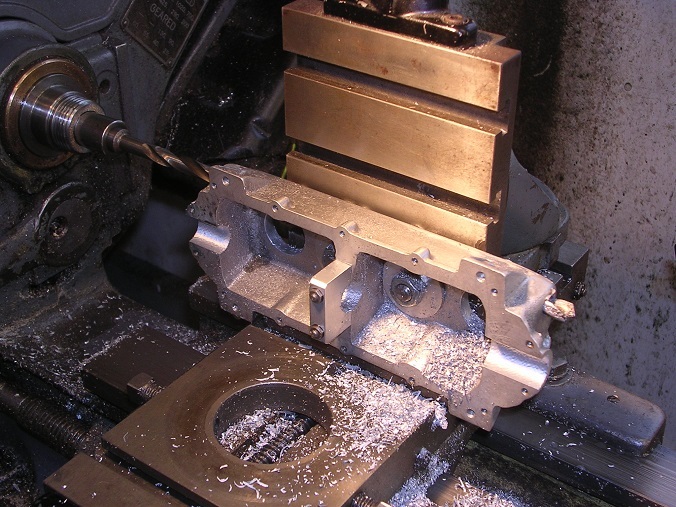 I have played games with the speed, tool angles, depth of cut and feed rates but to no avail. I kept going in the hope that I would strike the 'sweet spot' but alas and I am now 1.2mm oversize. I did a couple of spring cuts but each time, it just picked up the resonance. All extremely frustrating! 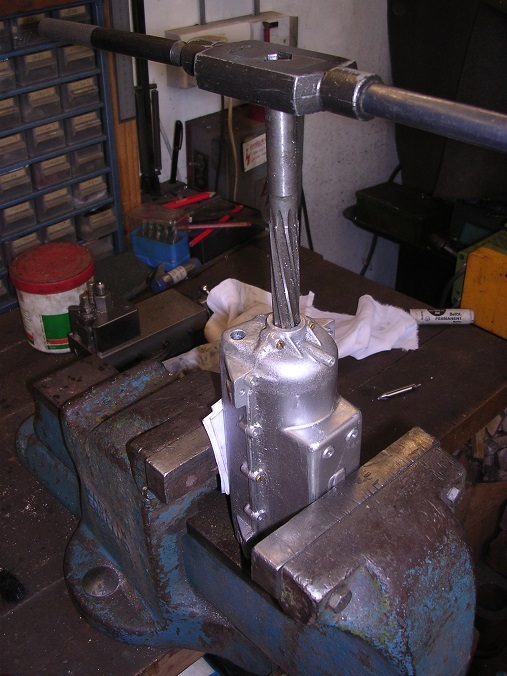 Perhaps I should have made the shaft longer to change its frequency. Mind you, this is the most amazingly rough bored finish I have ever seen! The only plus side is that at least the hole is in the right place. 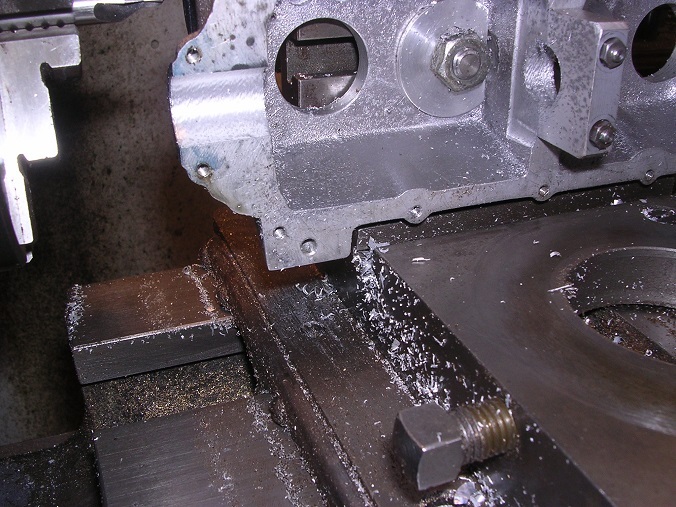 The hole is just shy of 9/16" so perhaps I will try an expanding reamer just to tidy it up a bit. 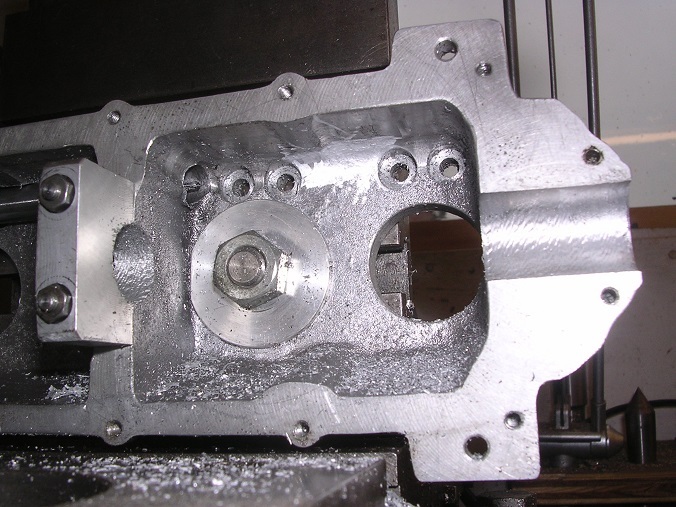 To get it low enough for the camshaft hole, I had to make sure that the casting hung over the edges of the cross slide. Drilling that hole will be the next challenge. There is not much satisfaction in this one. 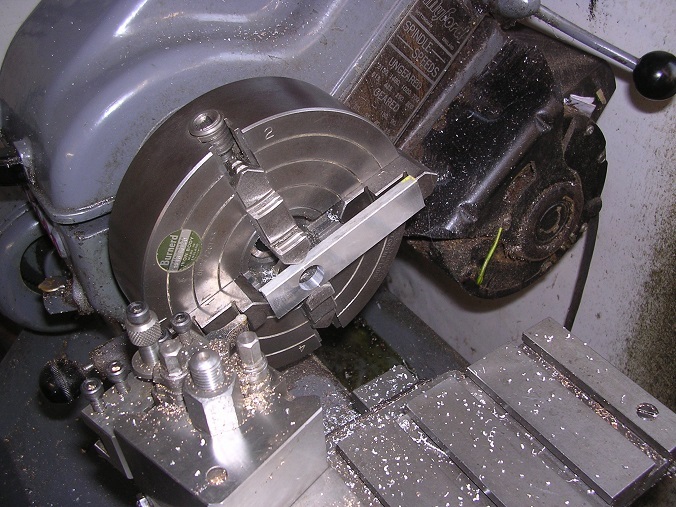 I find that if I get some chatter I cut spindle speed in half. If it chatters again cut in half. 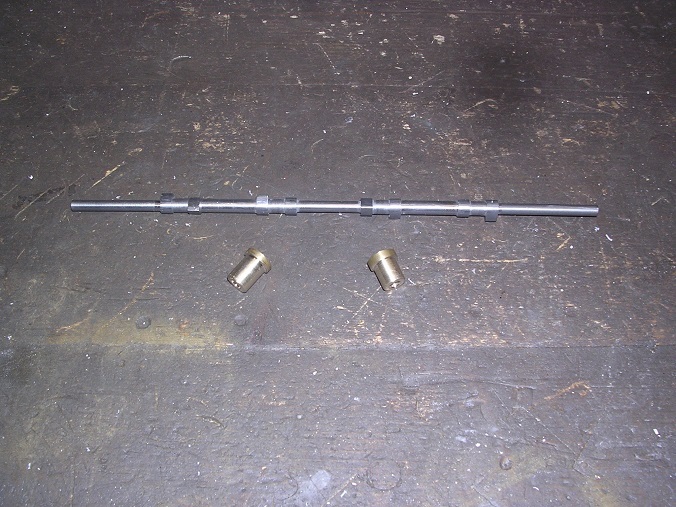 Just today I had to use a boring bar to bore a 2 inch bore 6-1/2 deep blind hole. 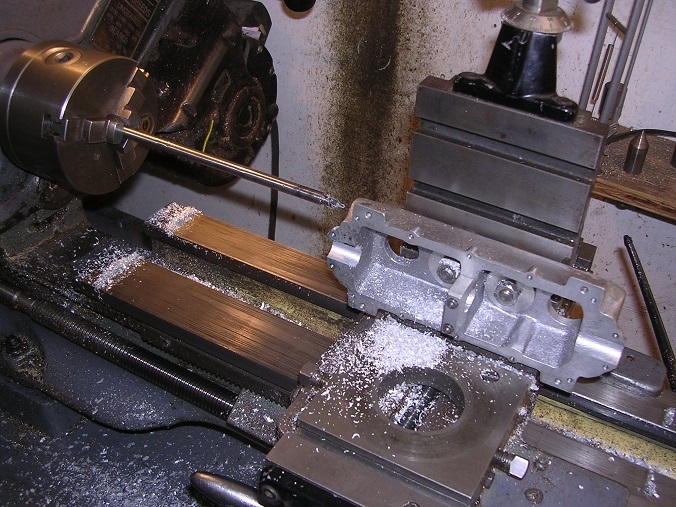 I was down to 150RPM but got a good finish. Took forever! 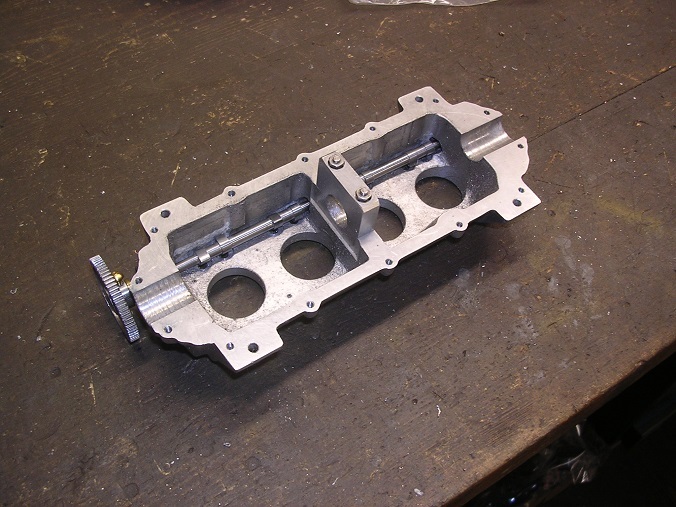 make a bracket mount of that tee slot.that would help could the centre be done before the sump is put back. 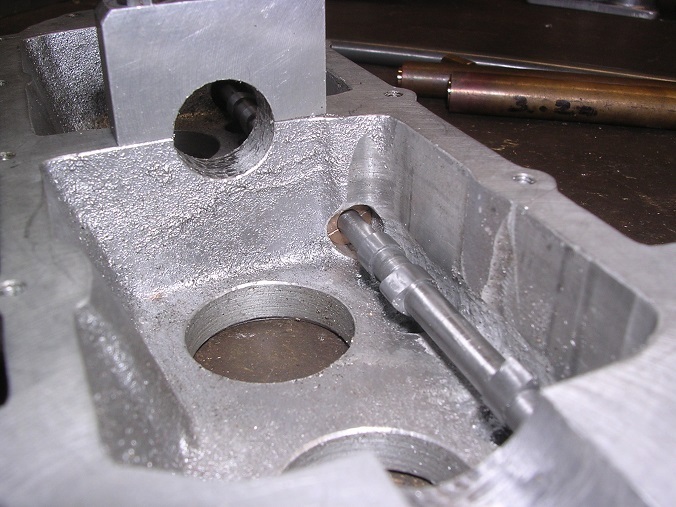 they had arms which could be moved and placed next to the hole.but a bit hard for the centre when the sump is on. 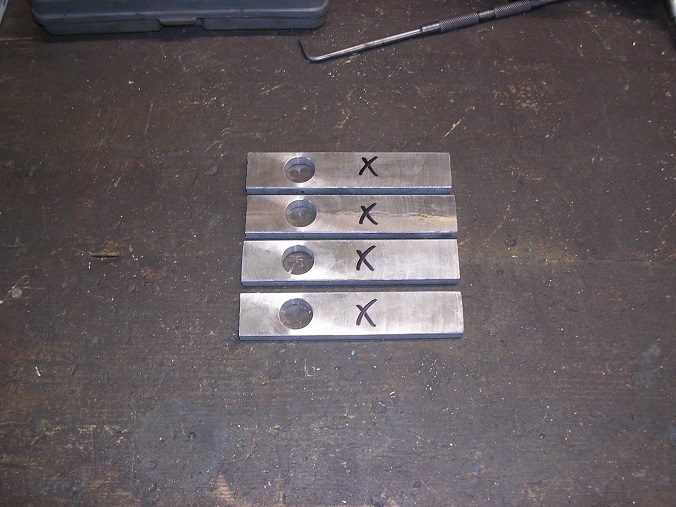 at least use three separate tools one for each hole so the bar can be much shorter. 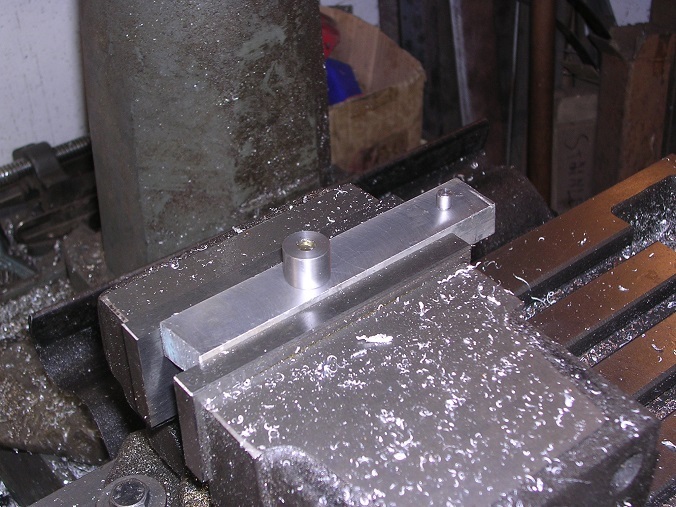 using the long bar the fixed steady could have been used as close as possible to the cutting tool shift to the other end when cutting that but the centre would need more support the shorter bar would be better. i would set it up again and try again with a shorter bar. I am back on line! Sorting out IT is worse than trying to bore crankshaft bearings! Firstly, many thanks for all of your assistance. I value every single contribution and the kindness with which it is offered. However, I make my own decisions and my own mistakes (as you can see!). I have learned a lot from this one and will approach it differently the next time I do one! Back to engine building. 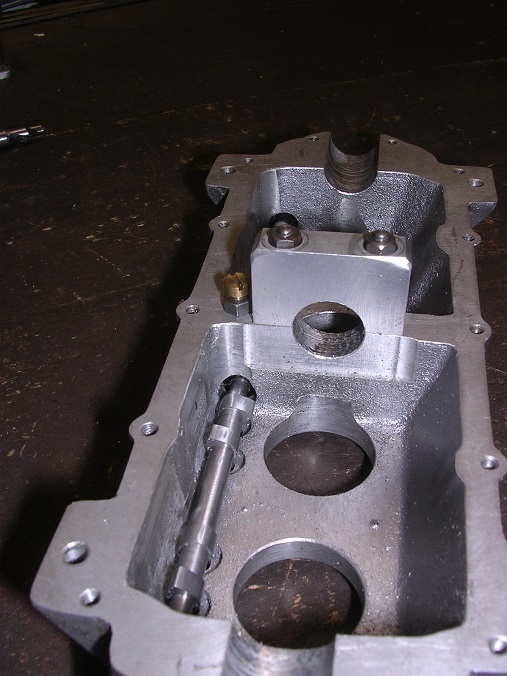 I indexed the case down and across and centred for the camshaft hole. A nice new drill soon sorted that. 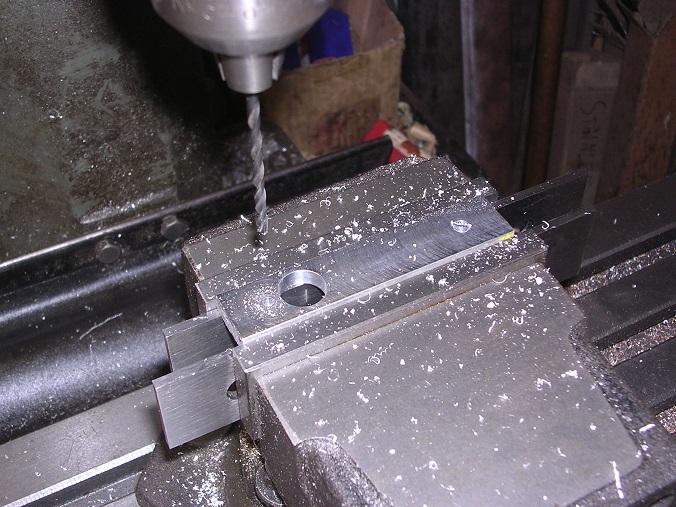 Then I used my extended centre drill and very gingerly marked the centre bearing hole. My new drill sorted that one out. 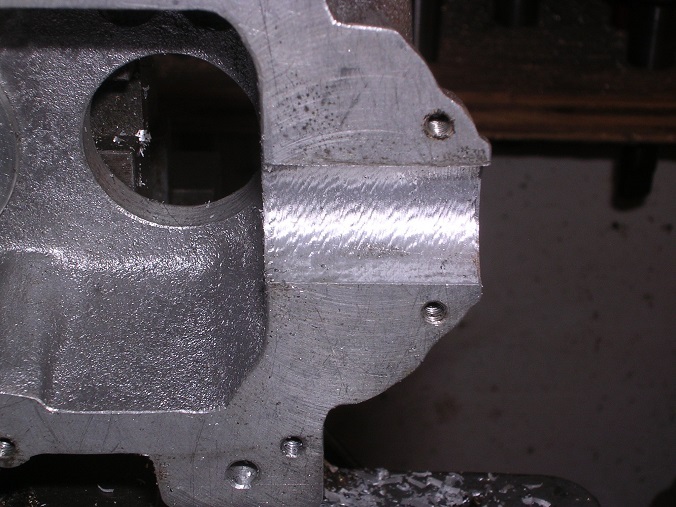 I pulled the centre drill right out of the chuck to get the last hole through but found that it hit the inside of the crank case, pushing it over. I tickled that out with the Dremel before centring that one as well. 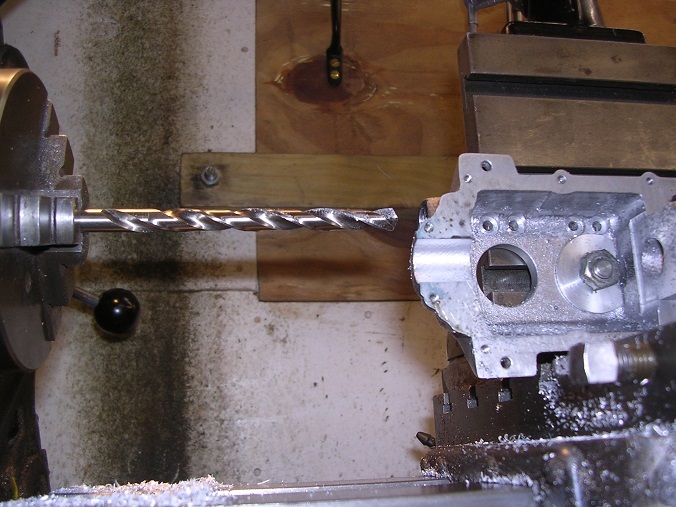 The extra long drill I was given finally went through there. Now, the moment of truth. 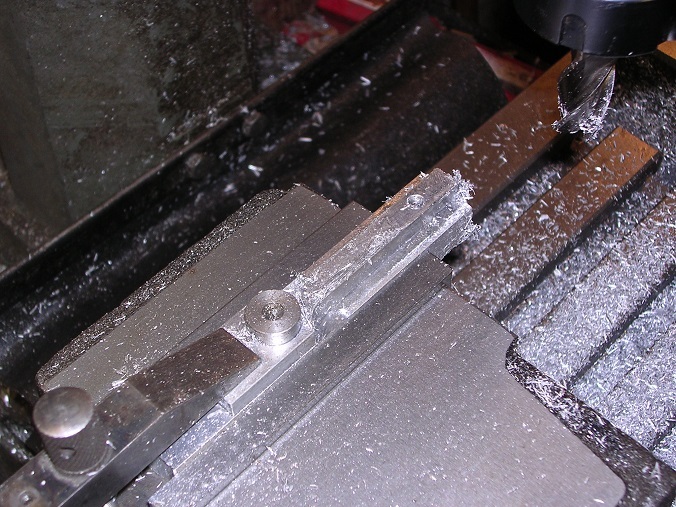 My 8mm reamer fell through the first hole (0.007" oversize) but cleaned the other two nicely. 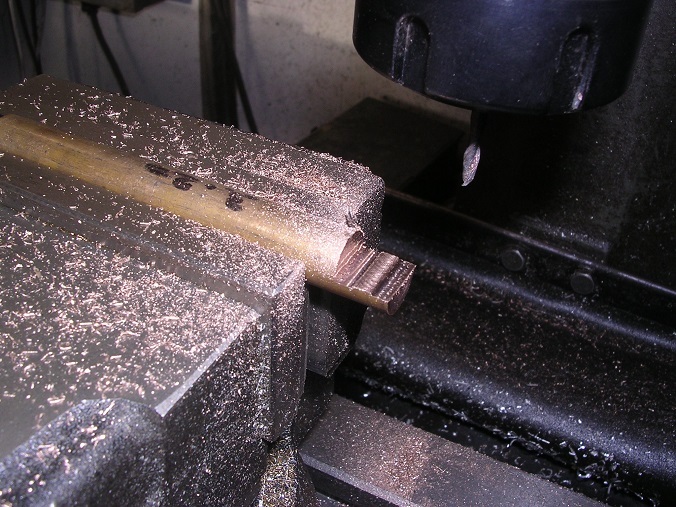 I found in stock, a 9/16" reamer so I put that through the crank holes and it cleaned them up a bit. As they will be bushed they will be fine although the quality is a bit of a dent to my pride, to say the least. Oh well. 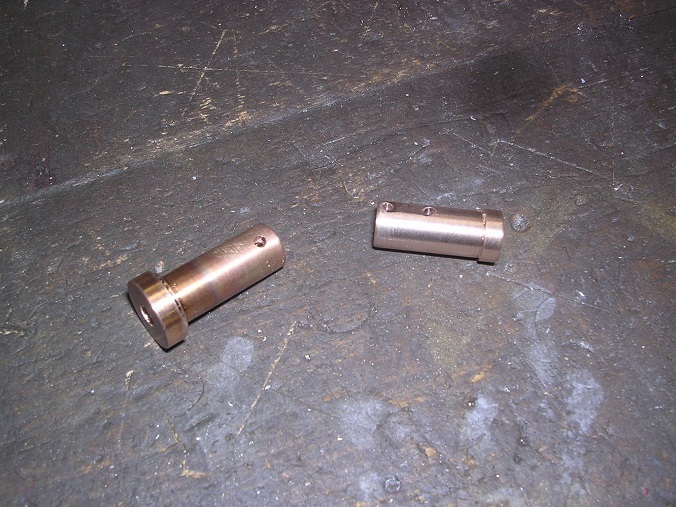 I made a couple of temporary camshaft bushes to try the installation. 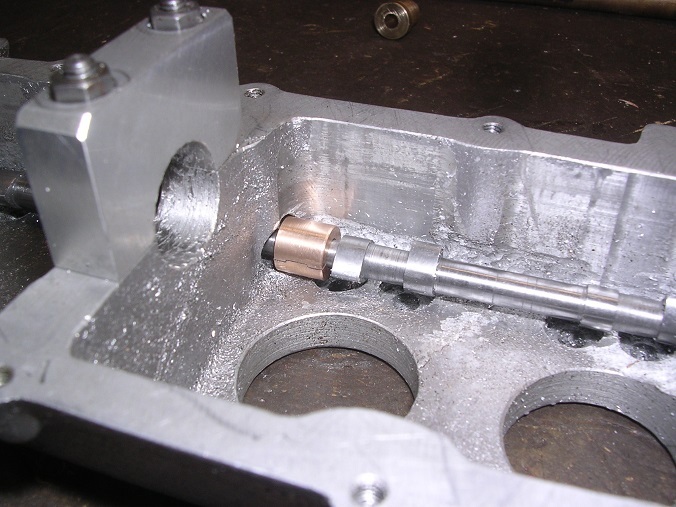 The shaft wangled in OK but the cams actualy foul the inside of the crank case. More work with the Dremel sorted that. I did the same for the other half but raised it in the middle instead. 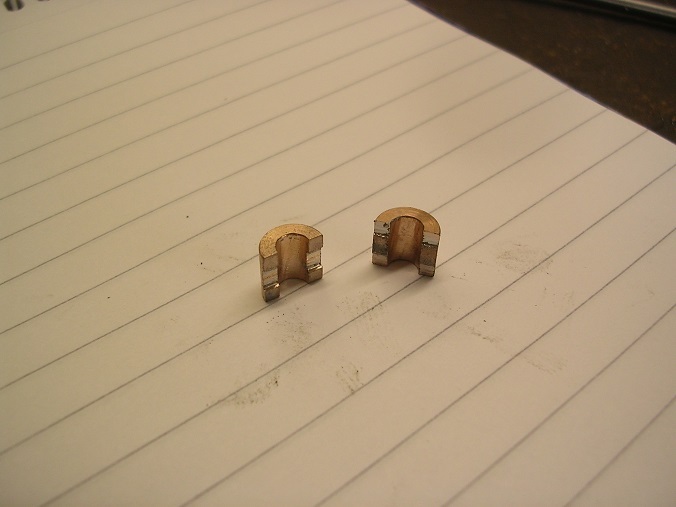 These were soft-soldered together and then turned to size. 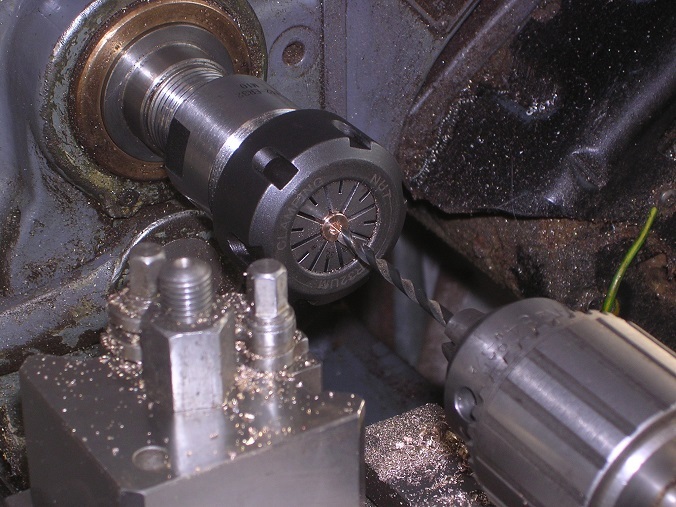 I drilled the hole, holding the bush in the collet chuck so that I would't burst the joint. Warm it up to melt the solder and bingo! I was pleased with the result but as it could only be a push fit, I was concerned that it would walk out of position again. 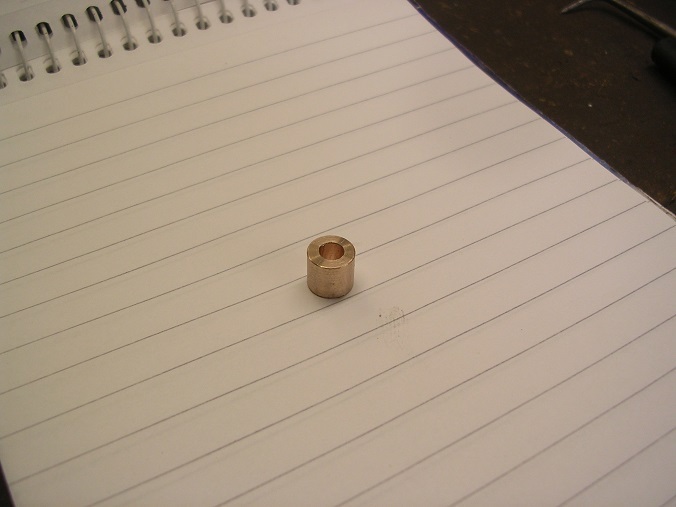 I have therefore dimpled the bush and added a locking screw. Now I had the problem that if I screw it tight enough to stay in place, the bearing binds! I added a locknut so that, hopefully, it will stay in place. Interrestingly, this is the solution that Thornycrofts used in my lorry engine although the two halves of the bushing were bolted together around the camshaft in that case. 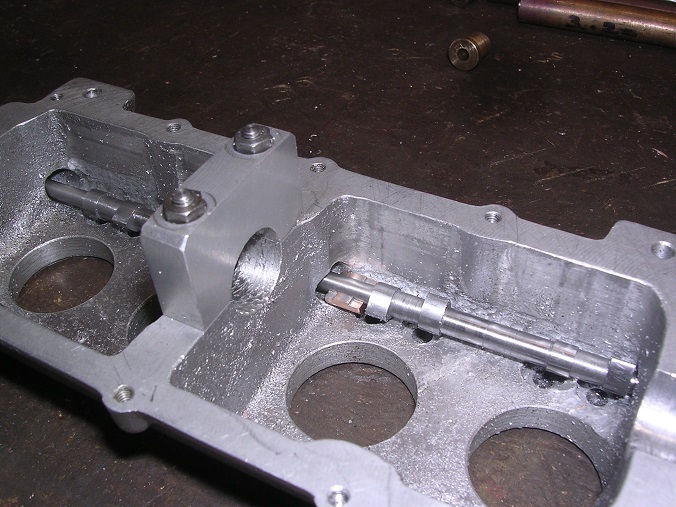 The joys of a crank case you can get both hands in at once. 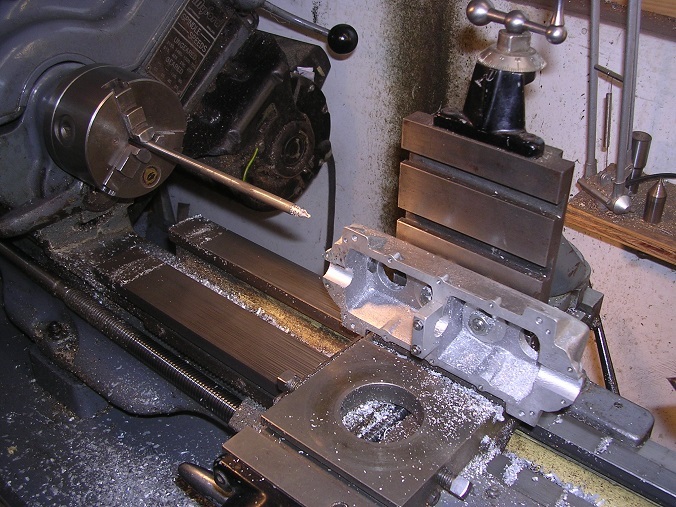 I have also turned up the final camshaft end bushings. I feel crankshaft and con-rods looming. Fantastic fix for perhaps one of the ugliest jobs there is. 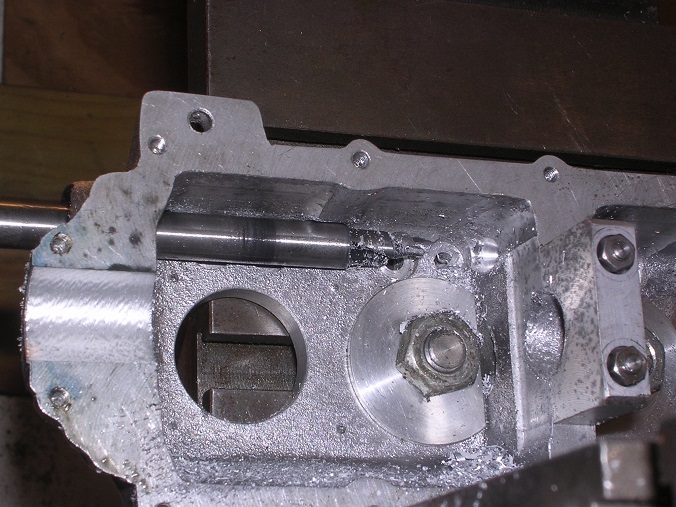 Why they don't cast the cam area with extra metal that can be later machined out I have no idea. 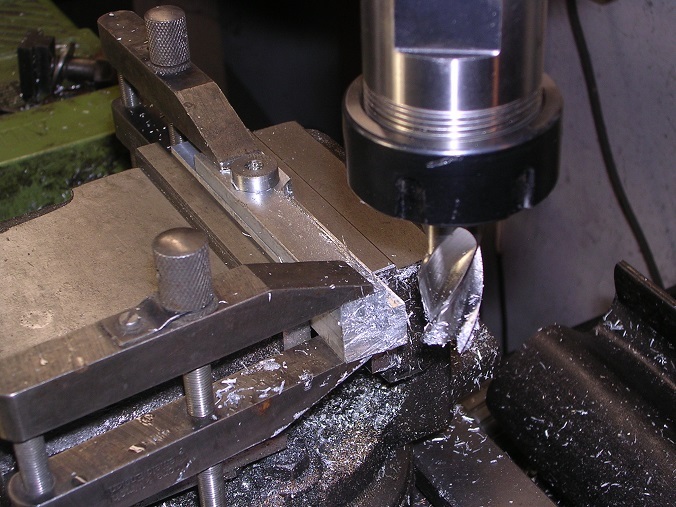 I would pay whatever it cost in extra aluminum not to go through the extra work involved. The Holt castings are like that. A method that I used seemed to help a bit. 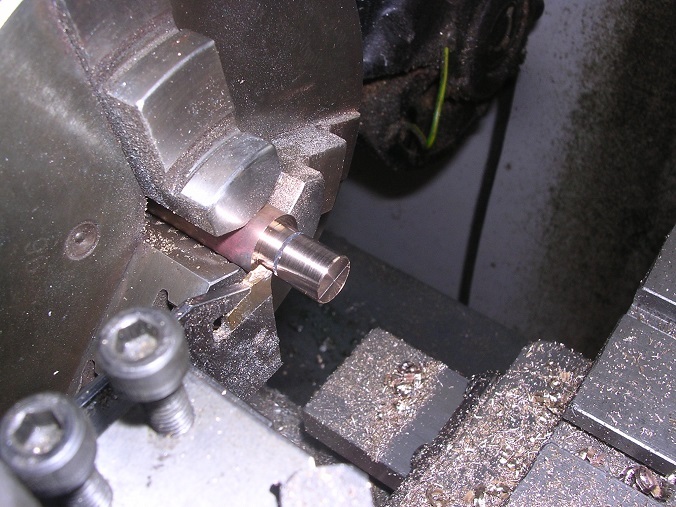 You put the first hole in (finished diameter) then make a guide bushing that fits snugly in the hole. 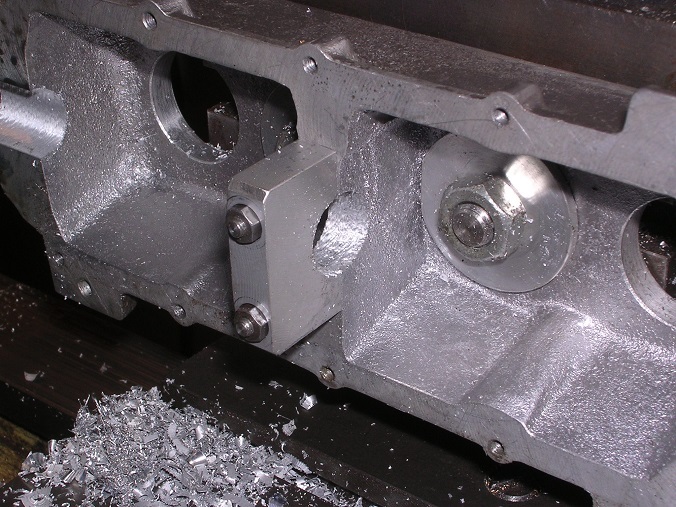 The bushing is long enough to go from the end of the block up to the next bearing. 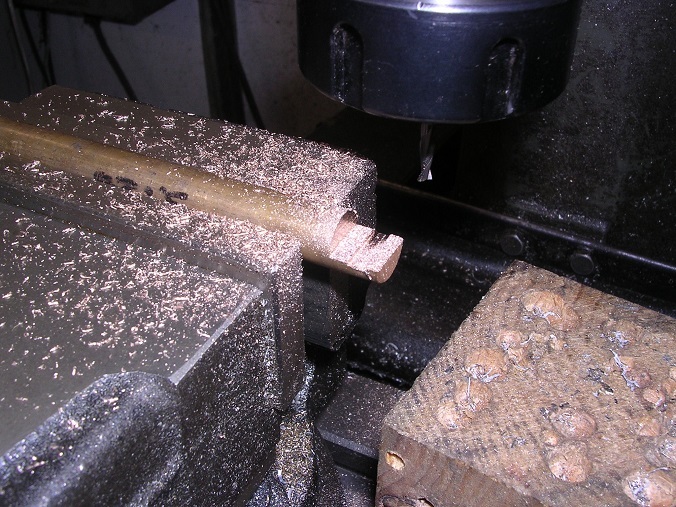 You then take a piece of shaft that fits nicely in the bushing and drill the end to lightly press in a center drill. 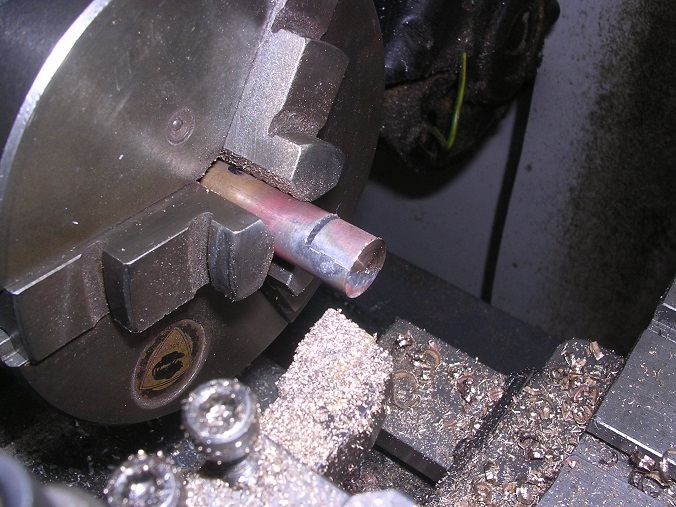 Oil up the shaft, slide it into the bushing and center drill the next hole. 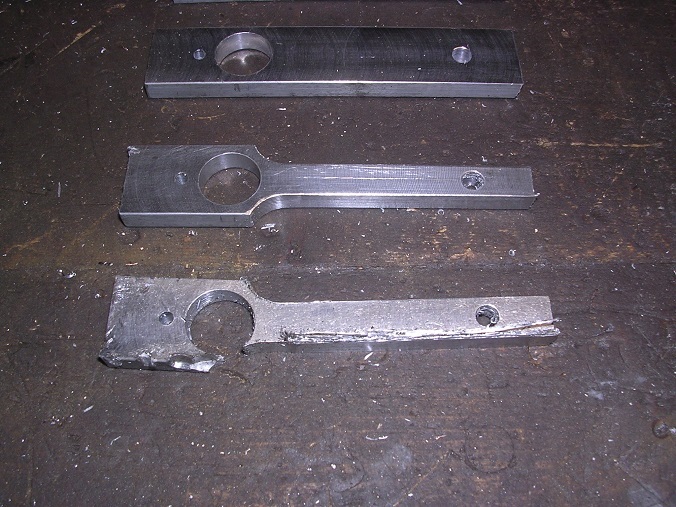 Yesterday, I made a start on the connecting rods. The drawings specify 'Dural' which I am told is a generic term for high tensile aluminium alloys. I managed to obtain some 2014/HE15 which my supplier recommended. 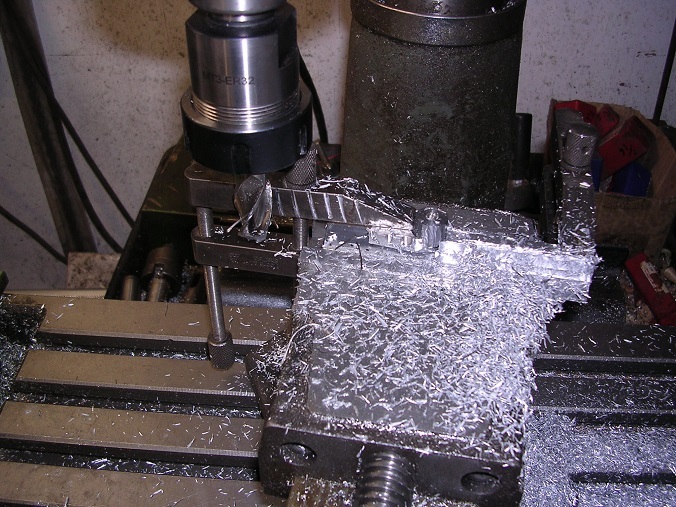 The first challenge was how to hold and machine the things and I did spend a long time puzzling. 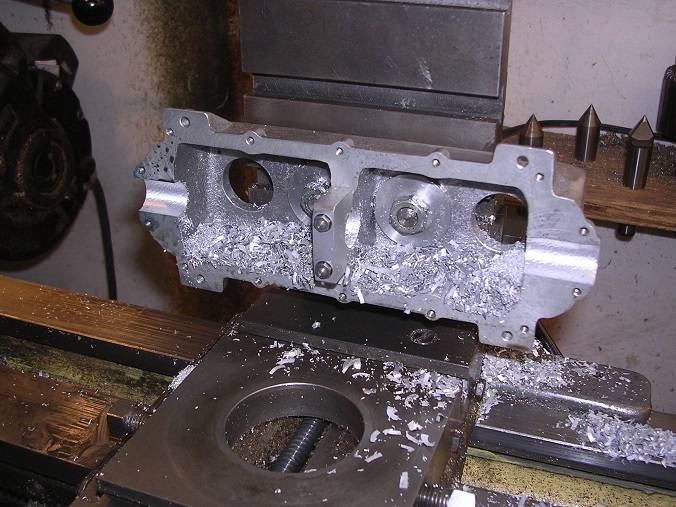 When in doubt, start with some datum holes! I took a skim off the face as well so that everything was flat and square. I turned them over, skimmed to thickness and positioned the other holes using the leadscrew dials to get the right pitch. 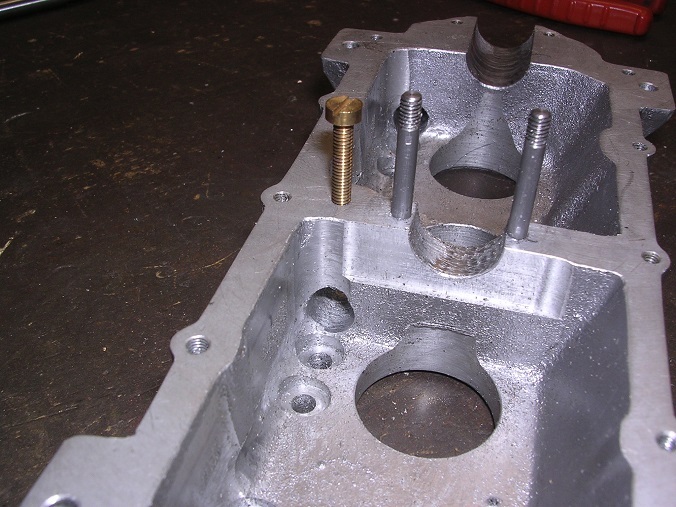 Then a block in the vice with pegs to locate the big and little ends. Last cut of the day, a moment's lapse in concentration and I moved the power feed the wrong way. 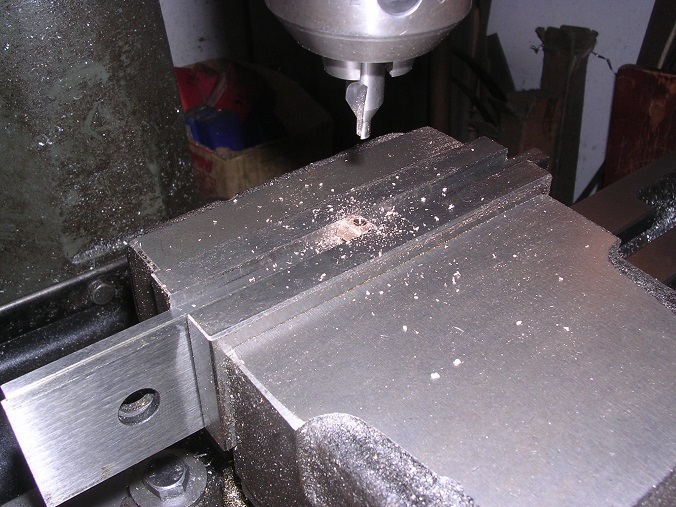 The mill bit in, the vice moved the milling head moved and I smashed my new end mill whilst wrecking the job. I was not a happy bunny! Time to stop, I thought. Today, I shall be rectifying the damage. The joys of model engineering. Shame about the mishap Did you buy enough Ali for any extra rods? And it really illustrates what can happen when not 100% concentrated on the job using power tools. Shame about the nice con-rod, and the tools.